Those clouds are angels' robes. 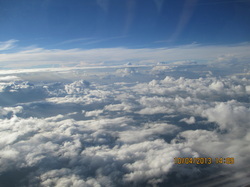 As a child, I imagined that God dwelled somewhere in or above the clouds. Flying from Tucson to Dallas, to New York City, and into Montreal gave me time to ponder Heaven and those ancestors who have gone before. They paved the way for our good fortune and freedom, health, wealth and the pursuit of happiness - goals they sought upon leaving France for Canada in the 1700s. 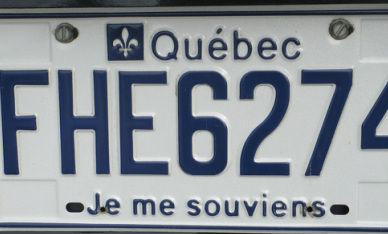 Later, many left from the province of Quebec, Canada to the United States following Homestead Act of 1862. 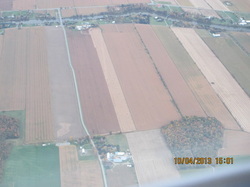 Flying below the clouds upon approach to Montreal I could see the long, narrow strips of land beginning at the tributary of the St. Lawrence and beforehand could only image this system of land division that was crucial to the success of these farmers in the watering of crops. 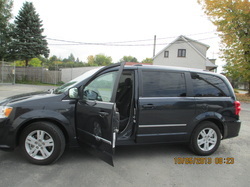 After renting a car at the Montreal Pierre-Elliot Trudeau International Airport and finding our way to the Sherton Airport hotel (without a GPS, which would have been very handy since the GPS on our cellphones did not work in Canada), we enjoyed a meal. We turned in early for an overnight stay before heading out early south-east, or est as the direction is marked in French. The sign for west reads ouest. How did our ancestors find their way? Sometimes a trip must be made more than once to grasp the full impact. After returning home, I continued to research and found that my mother's maternal grandfather, Jean Leon Maximin Hebert, was born in the parish of St. Laurent de Montreal 1841. Had I known beforehand, I would have scheduled some time to research the location of the cemetery. Upon landing at the airport, we were standing in the backyard, or at least in the neighborhood of his burial, as St. Laurent borders the airport property. To paraphrase: "Je me souviens. This simple economy of expression is worth more than the most eloquent speeches. We remember the past and its lessons, the past and its misfortunes, the past and its glories. In 1919 the historian Pierre-Georges Roy underlined the symbolic character which says so eloquently in three words, the past as well as the present and the future of the only French province of the confederation."